Louisa Howard and Natalie Rosseau’s shared interest in art and their desire to incorporate it into medical training culminated in an event at the George Washington University (GW) Luther W. Brady Art Gallery that married the art and science of medicine. 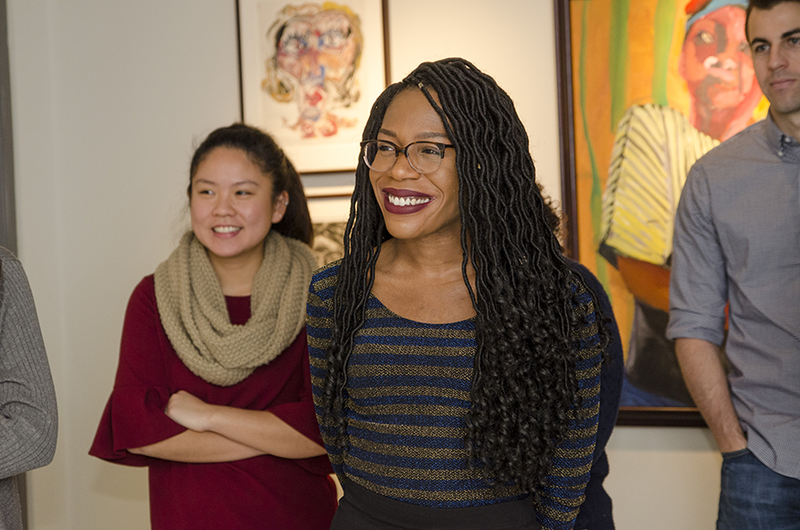 The first-year GW School of Medicine and Health Sciences (SMHS) students invited their classmates to the gallery for an evening of art appreciation and activities to heighten their visual observation skills in November. The idea sprung from a trip that Rosseau and Howard took with their first-year class to the Holocaust Museum to learn about the complicity of medicine in the atrocities that occurred during the Holocaust. While it was a sobering experience, Rosseau said, it also inspired her to search for other ways to integrate humanities-based experiences into her medical school training, especially through the arts and medicine. create a program to bring medical students to the facility. “There’s so much creativity that people forget about in medicine,” she said. esake, Luther W. Brady Jr., MD ’48, HON ’04, BA ’46, AA ’44, is one of the world’s foremost oncologists who also serves on the SMHS Board of Advisors. In addition, Jeffery S. Akman, MD ’81, RESD ’85, vice president for health affairs, Walter A. Bloedorn Professor of Administrative Medicine, and dean of SMHS, is a friend of the gallery and has a piece of donated art displayed there. “Not only was the museum supported by physicians from the very beginning, but it also includes artwork given by physicians, so that was even more of a reason to bring physicians in training to the museum,” Rosseau said. In the days leading up to the event, Rosseau and Howard had to close registration due to an overwhelming response from their classmates and the small size of the gallery. About 25 students attended the gallery event, which was designed to help future doctors sharpen their visual observation skills and better communicate with patients and colleagues. Students attentively listened to Miller on a tour of the gallery and enthusiastically participated in a drawing activity, where one person would describe a painting to a partner who then had to draw it. This activity was designed to mirror the experience of patient hand-offs and reporting to an attending physician. The event was such a success that Howard and Rosseau said they want to plan other such experiences for their classmates, and maybe even try to get visual art appreciation into the MD curriculum.